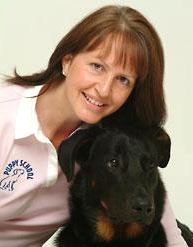 In 2002 Gwen Bailey (pictured) set up Puppy School, which has grown into a fantastic UK network of well-trained professional trainers who could help new owners give their puppies the best possible start in life. Well-trained, well-behaved dogs is the goal so that owners want to keep them all of their lives and even if the dog is unlucky enough to find itself in rescue one day, it will be easier to rehome. Thousands of puppies have now passed through Puppy Schools across the country and we hope that all of them have had better lives as a result. Gwen has written 9 books on animal behaviour and lectures in the UK and internationally. Puppy School Sevenoaks. Puppy training courses in the Sevenoaks area.